Times get tough in 1980’s New York in J.C. Chandlor’s A Most Violent Year. One glance at the trailer for A Most Violent Year will inspire a wellspring of comparisons. Everything from Road to Perdition to Goodfellas. Street toughs eking out a living in gritty crime worlds and underground lairs. The seedy underbelly of polite society. In a word, everything we’ve seen before a hundred times. Good news, film fans. A Most Violent Year is none of those things. A surprisingly refreshing take on the stagnant genre, J. C. Chandor (All Is Lost, Margin Call) focuses his camera on an East Coast business man trying to stay on the right side of the law. It’s an aim small, miss small approach that yields a slow yet interesting story of crime and the cost of doing business in 1980’s New York. The film centers on Abel Morales (Oscar Issac), a budding heating oil distributor on the verge of taking his business to the next level. Problem is, his competitors have taken to strong arm tactics in order to keep their piece of the pie. Trapped amongst his relatively legit business, a wife hungry for more (Jessica Chastain) and the ever escalating world of gang violence, it’s all Abel can do to keep his world from spiraling out of control. While I’m still not sold on Oscar Issac as a dramatic actor, he delivers a solid, stoic performance as the beleaguered business owner. Adept at being a likable everyman, Issac slips a bit when things swing to the more dramatic side. He has a limited emotional range but he uses what he has to the best of his ability. Issac doesn’t add much but he doesn’t detract either. Things improve as the trouble ramps up in the third act, but for them most part, he’s in the eye of a swirling storm just trying to hold on. Jessica Chastain, on the other hand, steals the show as his lifestyle hungry wife. Clearly the driving force in the relationship, Chastain continues to prove herself as one of Hollywood’s finest actresses. Sultry yet explosive, Chastain’s character seems to crave the seedy world of gangland living. Her ability to pull Abel’s emotional puppet strings is entrancing to watch. Chandor’s methodical direction hits the right beats in the right moments, even if much of the film is a slow burn. Scenes like Issac hunting outside his home for a potential threat are genuinely tense but the action is sparse. Those looking for Casino style bloodletting and violence will be sorely disappointed. What they will find is a constantly hanging threat of violence, which in many ways is more interesting than Joe Pesci kicking someone in the face. All Abel wants to do is run a (somewhat) legitimate business and the escalating aggression towards his truck drivers gives the story weight. It feels like a powder keg ready to explode. 1980’s New York is also well represented. Full of real world sets and on the nose mannerisms, the vibe is true to the time period without being over the top. Excellent supporting work from David Oyelowo (Selma) as an assistant D.A. and Albert Brooks (Drive) as Abel’s lawyer, sweeten the pot. Doing things simply is often the hardest thing to do. J.C. Chandlor tosses away the expectations of traditional mob films in favor of a more subtle, slow paced approach. 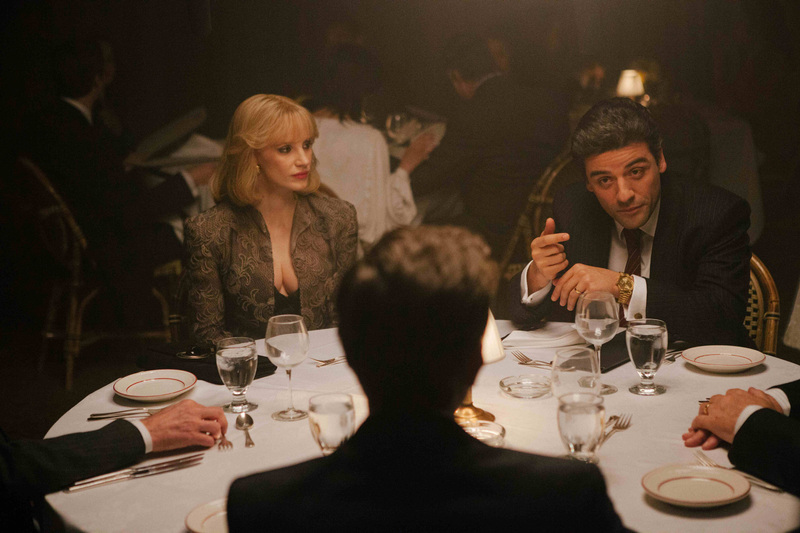 While this doesn’t have the pop and bombast of a Scorsese picture, A Most Violent Year separates itself from the pack with a quietly intense story of power and corruption. This entry was posted on Monday, February 9th, 2015 at 3:43 pm	and tagged with A Most Violent Year, crime, drama, J.C. Chandlor, Jessica Chastain, Oscar Issac and posted in Sightings and Such. You can follow any responses to this entry through the RSS 2.0 feed.